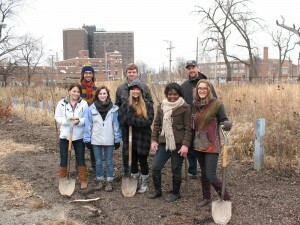 Next fall semester (2018) the Sustainability Studies program once again offers a unique transformational service learning course, SUST 350 Service and Sustainability, at the Chicago Campus as well as online. Taught by SUST professor Mike Bryson, the course theme this fall is Urban Sustainability, Environmental Conservation, Community Development. SUST majors and minors may take this class to fulfill an upper-level SUST 3xx requirement, but 350 also is open to students at large seeking a service learning course, needing a general education course, or desiring elective credit. 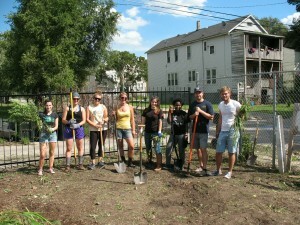 Students interested in a sustainability-focused service learning experience can choose either of two options. These two sections of SUST 350 are cross-listed, so they share a common Blackboard (Bb) site; thus, students in both sections will be able to interact with and learn from each other online. On-campus section (01) — Students in this section will meet weekly for a 10am-1pm class session in Chicago. The initial class meeting will be at RU’s Chicago Campus; subsequent class meetings will take place off-site at Eden Place Nature Center, accessible via the CTA’s Red Line and with secure on-street parking. Students traveling with Prof. Bryson will meet in the WB Lobby at 11:30am and take the Red Line to Eden Place (47th St stop); then return to RU by 3:30pm. Online section (98) — Students do the majority of coursework online in Bb and are required to complete a community-based service project of their own choosing, with guidance from and approval by the instructor. The project may be online or in-person; the latter option could be based in the student’s home community. Online students are also eligible to join the on-campus students on any workdays at Eden Place throughout the semester, as a way to get “in the field” service experience on Chicago’s South Side. Both sections will interact with each other in Bb to discuss readings, review assignments, and share experiences as a way to create a dynamic SUST 350 community. SUST 350 focuses on one of sustainability’s “Three Es” — social Equity — within the broad context of Environmental stewardship and Economic development. Students will learn about several interrelated components of sustainability — urban space reclamation, food production, ecological restoration, and environmental education — in the context of urban neighborhoods and ecosystems. By doing hands-in-the-dirt labor at the Eden Place Nature Center (EPNC) and Farm in the South Side neighborhood of Fuller Park, students gain direct knowledge of small-scale urban agricultural systems as well as relevant urban social justice issues such as pollution, transportation barriers, food deserts, environmental racism, ecosystem restoration, and persistent poverty. An urban farm is about food, but so much more besides. The Fuller Park community is an economically stressed neighborhood that is bisected by the Dan Ryan expressway and bounded by railroads on its eastern and western borders. Here, an urban farm and community nature center is a source of freshly grown, organic produce; a training ground for local youth in need of practical job skills; a stop valve in the Cradle-to-Prison pipeline; a gathering place for people of all ages in the community for physical exercise, informal education, and social events; a demonstration site for sustainable agricultural and ecological restoration techniques; a model of economic development on a local, sustainable scale; and a means of reconnecting urban folk to the natural world. 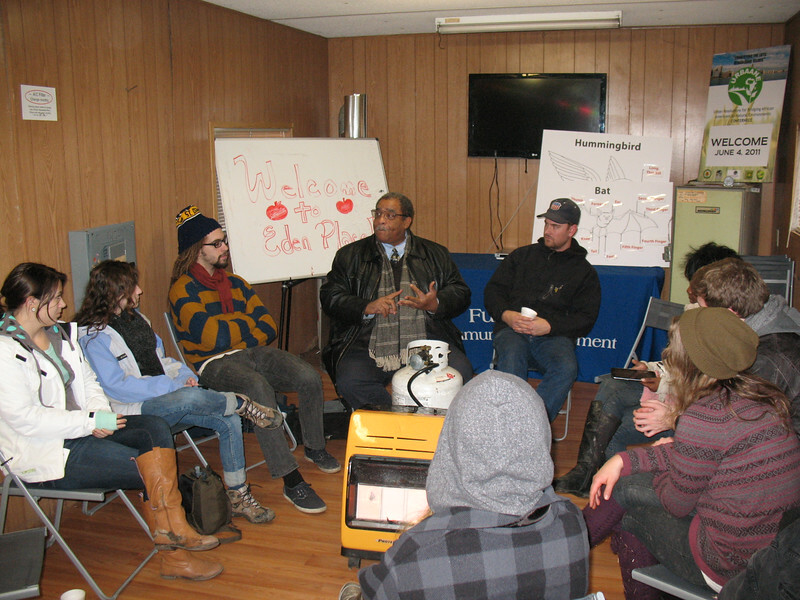 More generally, in urban areas starved for jobs, green space, safe outdoor gathering places, and fresh quality food, enterprises like Eden Place productively and powerfully address the need for social equity and progressive change. 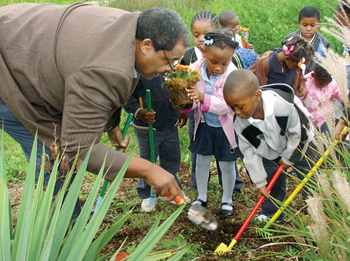 One key focus will be on helping with various urban agriculture and environmental restoration projects at Eden Place Nature Center at 4417 S. Stewart, as well as at the Eden Place Farm at 4911 S. Shields. A typical day consists of meeting at the WB Lobby at 11:30am to take the Red Line to EPNC (students have the option of commuting there directly to meet at noon); convening at 10am for discussion of assigned readings and, later in the semester, informal student presentations; and then working with Eden Place staff on various environmental, farm, and/or public education projects according to the needs and schedule of Eden Place. The vast majority of class work takes place outside, regardless of weather. 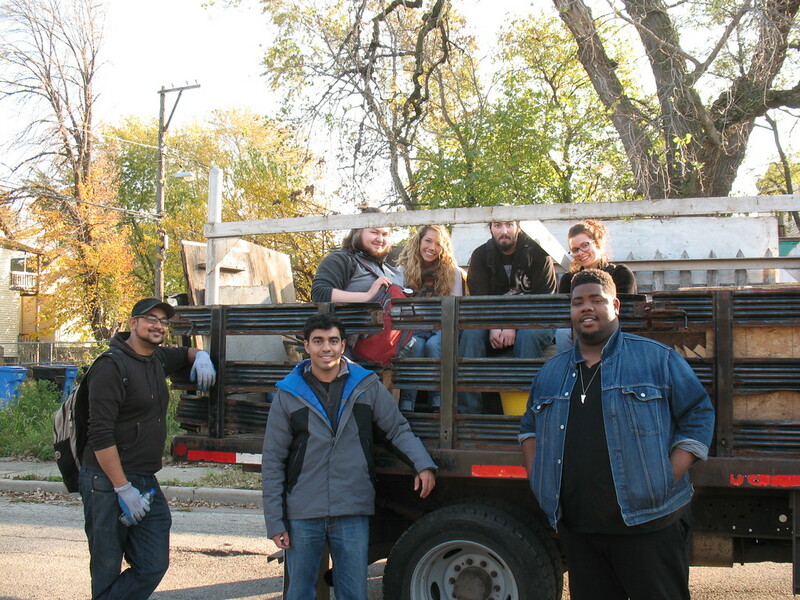 In past semesters, students have built trails, planted trees, pulled weeds, raked leaves, managed compost piles, helped set up activities and structures for Octoberfest, repaired and installed fences, and many other chores/activities. We also interacted with EPNC staff to learn about their mission and vision for the future. Last but not least, we always take a little time each week to visit with EPNC’s many animals, including Gaga the goat (who loved to intervene during our roundtable discussions in the gazebo by raiding our lunch boxes and, in one famous instance, eating a student’s notes). “In 1997, community member, founder, and Executive Director of Fuller Park Community Development Michael Howard [pictured at left] was concerned about the serious lead poisoning problems affecting the neighborhood children. Through research he discovered that Fuller Park contained the highest lead levels in the city of Chicago. As a community leader he wanted to make some serious changes for the sake of his family and his entire neighborhood, and he decided that this work would start with the illegal dumpsite located across the street from his home. “Mounds of waste over two stories tall encompassed the entire three acres of land. Mr. Howard acquired the deed for the land and involved the community in a large scale, three year clean-up of the dumpsite. 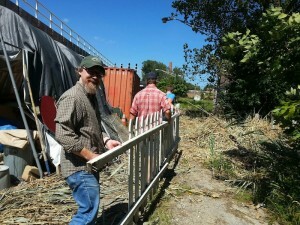 Alongside his wife and fellow activist Amelia, and in partnership with hundreds of volunteers and community members, Mr. Howard led a clean-up project in which more than 200 tons of waste including concrete, wood, tires and other toxin-laced materials were removed from the site. “Upon clean-up of the site, the next step was development. Tons of fresh soil were brought in to establish the Great Lawn, and the Hope Mound was established as the first permanent fixture on Eden Place. 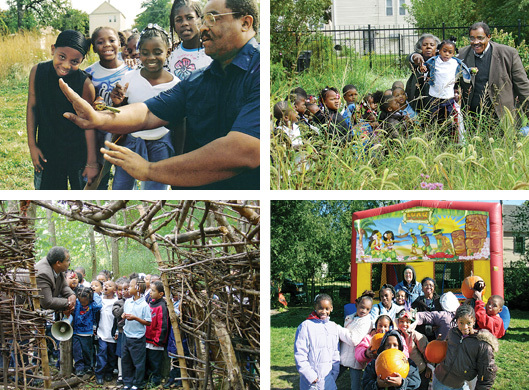 South Point Academy trainees contributed a number of early structures to the Eden Place grounds, including the gazebo, DuSable Trading Post, and the storage sheds. The Mighty Oak and other surrounding trees formed the woodland at the north end of the property, including a reflecting pond meant to encourage reflection and respite from the urban surroundings. For more information on this unique service learning course, please contact Prof. Mike Bryson (mbryson@roosevelt.edu or 312-281-3148). Also see this essay co-written by Prof. Bryson and EPNC founder and director, Michael Howard, and published in the 2017 book, Wildness: Relations of People and Place.